The view of knowledge upon which the inquiry here at Beyond this Brief Anomaly is based starts with recognising that all concepts are, in effect, models of the reality to which they apparently relate as true characterizations, and as such, do not capture that reality in terms of an essential nature that it possesses. While such a view continues to sit outside the mainstream of Western culture, it is taken increasingly seriously within the contemporary mind sciences, as depicted in the figure below. 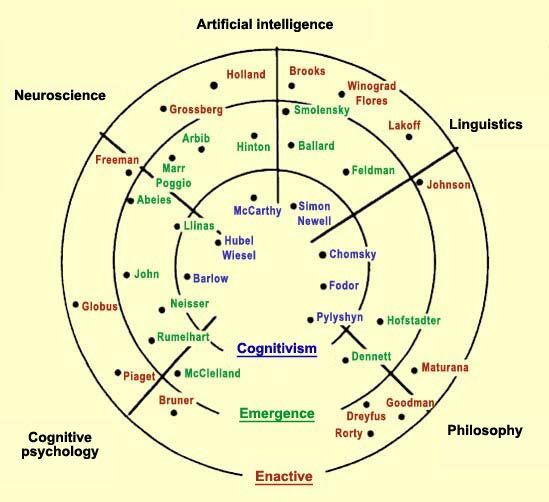 The cognitive sciences in 1991, showing principal disciplines, different approaches and major contributors at that time. Source: The Embodied Mind: Cognitive Science and Human Experience, by Francisco Varela, Evan Thompson, and Eleanor Rosch, Cambridge, MA: MIT Press, 1991, figure 1.1, p. 7. Investigators associated with the enactive paradigm (the outermost ring in the diagram, shown in red) are most closely aligned with views in which conception can be regarded as “essentially mistaken”. Moreover, this view has a very long and distinguished history in relation to the philosophy of mind and knowledge. For instance, it sits at the heart of Buddhist epistemology, as articulated by the Indian philosopher Dharmakīrti (c. 600 CE). The principles upon which Dharmakīrti’s view of knowledge is based are strongly consistent with those that support Beyond this Brief Anomaly more generally (key influences and inspirations here include , , , , , , , ,  and ). Excerpts from a contemporary commentary on Dharmakīrti’s views by Georges Dreyfus and Evan Thompson  are provided below as an introduction to these principles. For those interested in reading further, the source from which these excerpts are drawn is available here. The particular elements of Dharmakīrti’s view that I’ll introduce below are sufficiently consistent with the outlook at Beyond this Brief Anomaly that they can be regarded as pointers to the view of knowledge that will carry the inquiry forward. This view is part-and-parcel also with the inquiry’s systemic character—it provides a close fit with a systems way of thinking. Dharmakīrti’s views on the relationship between thought and language are also directly relevant to the inquiry. The excerpts below should provide a sufficiently comprehensive overview for our purposes; I’ll follow these up with a brief summary and some comments on what this all means in practice. Dharmakīrti’s philosophy…emphasizes the constitutive and constructive nature of language…experiences give rise to mental representations, which are transformed into concepts by association with a linguistic sign. The formation of a concept consists of the assumption that mental representations stand for an agreed-upon imagined commonality. Thus concepts come to be through the conjunction of the experience of real objects and the social process of language acquisition. Concept formation is connected to reality, albeit in a mediated and highly indirect way. Given my declaration of intent in Beyond this Brief Anomaly’s opening post, and subsequent pre-emption of the route that the inquiry would take, it doesn’t seem entirely unreasonable to simply let this introduction to Dharmakīrti’s view of knowledge rest in its raw form. Even so, there’s much to grapple with here, and some further interpretive remarks may help with clarifying the significant points. At the centre of this view lies the insight that all knowledge expressed in language is necessarily of a conceptual nature, and as such is fundamentally differentiated from what we perceive directly. Our direct perceptions are a consequence or function of interaction between our whole “perceptual apparatus” and objects and events we encounter in our environment—we don’t perceive things as they are, but as they are available to us via the means we have for encountering them. There’s a tight causal relationship between things we perceive and our perceptions, but it is aspects of the objects that arise as perceptions, rather than the objects themselves. So while we have immediate experience of the objects we encounter, we don’t have un-mediated access to our environment, to the world of things and events in which we’re immersed. This is not to say though that our perceptions are mistaken or distorted—they simply are as they are; for each of us, the world in which we’re immersed consists of “things and events perceived”, as our perceptions arise. The process by which we form concepts is of a different nature. Where perception is a matter of direct encounter with objects and events, conception involves generalisation—or abstraction—from the particulars of the situations in which we find ourselves, as we attempt to identify commonalities across changing contexts. Conceptualisation is the process of isolating and describing relatively invariant features across the flow of objects and events experienced through perception. As such, it involves the transformation of the perceptual stream into a set of relatively fixed or concrete conceptual entities. Whenever we name some entity within our field of awareness, or categorise it as belonging to a particular class of things, we make the leap from perceiving to conceptualising. Language is thus fundamental to conceptual knowledge and its formation. Language is not simply the mechanism by which concepts are formed though—it’s the basis for the utility of conceptual knowledge, and in a sense therefore the point of forming concepts in the first place. Language and conceptual knowledge allow us to organise and cooperate socially with one another. Conceptual knowledge is thus oriented towards the practical business of coordinating our action together. As a set of constructs—tacit social agreements about the what, why and how of phenomena—laid over the top of our perceptions, the conceptual realm does not capture or represent the nature of things and events in a positive sense i.e. by grasping what they really are beyond the particular ways they present in this or that situation—despite this being the commonsense view, or what seems on the surface to be going on. Rather, what we’re dealing with when we construct concepts is, in the language of systems, a series of boundary judgements. While the establishment of a boundary appears to involve a positive determination about what something is, consider for a moment the inverse perspective: establishing a boundary can also be regarded as making a negative determination about what something is not. It turns out that this latter characterisation is in fact a better fit with what we actually do when we draw a boundary. You can test this very easily by applying it to things in your own environment right now. By way of an example, on my desk, I have the water bottle introduced to illustrate the energy laws a little while back. I also happen to have another bottle of the same brand and design in a larger size sitting right next to the original. In identifying the original bottle—in effect, putting it inside the boundary of “bottles used in our example system the other week”—I’ve had to differentiate it from the larger bottle (as well as all the other paraphernalia on my desk). The term differentiate provides us with a clue here, for to differentiate is “to determine or identify differences”. When we differentiate, we don’t capture the essential and invariant features or characteristics of some thing—we don’t “grasp its essence”. What we do in such situations is to separate the thing in which we’re interested from what, in our judgment, it is not. In recognising similarities between distinct mental experiences—preparing the way for conceptually associating the experiences with a common constructed category—we decide, in effect, not that those mental experiences are the same, in the sense of possessing common real and essential properties, but that they are insufficiently different to exclude them from a conceptual boundary that we create. Incidentally, this offers an effective demonstration of how the systems way of thinking has significant benefits not only for describing situations of interest to us, but can also be used to shine a light on our thinking itself—it can help us to investigate the way things appear to our commonsense view, in order to get a better sense of what might be going on beneath the surface. To regard conceptual knowledge as in an important sense mistaken doesn’t imply that it’s invalid, or that its value is compromised—it just means that its status is different to that which we tend to afford it by default. Recognition of this holds the potential to reinvigorate our sense of responsibility for our conceptual capital, for it is very much a product of and hence subject to the vagaries of collective human institutions and our individual tendencies. By appreciating that it is basically mistaken—to the extent that we shouldn’t expect it ever to be complete or free of uncertainties—is grounds for treating the conceptual domain with greater rather than lesser care. Moreover, that our conceptual knowledge is mistaken doesn’t simply mean that “anything goes”: our conceptual world is not merely arbitrary. Conceptual constructs, in order to be both meaningful and socially legitimate must be both coherent and integrated with the established set of tacit social agreements through which we organise and coordinate activity in any given situation. In this sense, concepts can be judged more or less valid than one another. This is a matter though of establishing the relative or conventional rather than the ultimate or absolute truth of a given concept. Maturana, Humberto R. & Varela, Francisco J. (1988). Tree of Knowledge: the Biological Roots of Human Understanding. Boston: New Science Library. Lakoff, George & Johnson, Mark. (2003). Metaphors We Live By (second ed.). Chicago: The University of Chicago Press. Varela, Francisco J., Thompson, Evan & Rosch, Elanor. (1993). The embodied mind: Cognitive science and human experience. Cambridge: MIT Press. Bruner, Jerome. (1986). Actual minds, possible worlds. Cambridge: Harvard University Press. Thompson, Evan. (2007). Mind in Life: Biology, Phenomenology, and the Sciences of Mind. Cambridge, Massachusetts: Harvard University Press. Bruner, Jerome. (1990). Acts of meaning. Cambridge: Harvard Universtity Press. Lakoff, George & Núñez, Rafael E. (2000). Where mathematics comes from: How the embodied mind brings mathematics into being. New York: Basic Books. Maturana, Humberto R. & Varela, Francisco J. (1980). Autopoiesis and Cognition: The Realization of the Living. In Boston Series in the Philosophy of Science (Vol. 42). Dordrecht: D. Reidel. Lakoff, George & Johnson, Mark. (1999). Philosophy in the Flesh: the Embodied Mind and its Challenge to Western Thought. New York: Basic Books. Dreyfus, G and Thompson, E. (2007). ‘Asian perspectives: Indian theories of mind’. In The Handbook of Consciousness, Cambridge: Cambridge University Press. (pp. 89-114).